In the shadow of Mont Blanc, Chamonix is perhaps the adventure capital of Europe. Mountain climbing, hiking, skiing , para-penting, etc. And while there are lots of great mountain biking trails, there are not that many good Road bike routes. But today, I did one of the best (although using a hybrid). Map and elevation profiles at bottom. And reaching over 2200 metres (7280 feet) meant I was in full winter gear for the first time in months. Heading north from Chamonix the route started up the fairly easy Col des Montets. This road links the Mont Blanc region of France with the Valais region of Switzerland and thus while not too busy, still has more fast traffic than I usually like. After descending Montets, I crossed into Switzerland and almost immediately exited the main road to start climbing to Lac d’Emosson – a large glacial lake created by a huge hydro-electric dam. 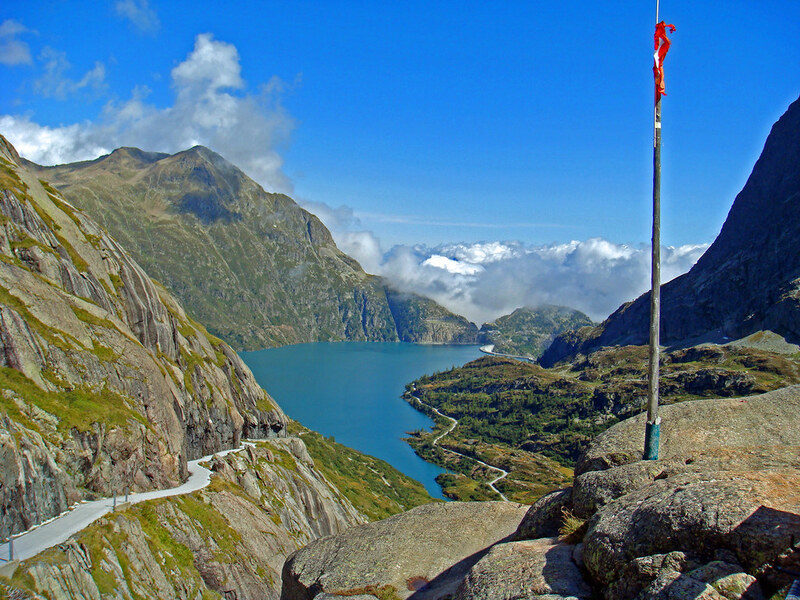 The Lac d’Emosson was created by building a hydroelectric dam in the 1920s to cover the Swiss Federal Railways power requirements. The lake can be reached by three unusual railways. More here. At the little chapel was a plaque commemorating the Battle of Emosson in 1323 – yes 1323! This is a steep climb (see chart below) – the last 6 kms all between 9% and 10% (and much steeper above the lake) – on quiet roads with unbelievable views of Mont Blanc – directly into the sun unfortunately for photos. 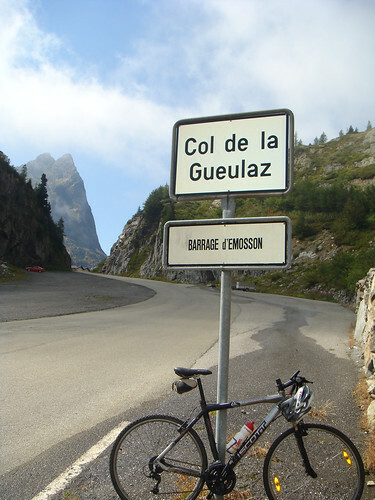 At 1950 metres (6400 feet), the Col de la Gueulaz is at the lake itself. Truly beautiful. This was my goal for the day. But while taking photos I noticed a little road across the lake heading higher! You can see part of this amazing little road above in the big photo just left of center. This was the path to a smaller dammed lake – Lac du Vieux Emosson – at 2220 metres. I was tired but just had to have a look. By cycling over the big dam, then along a little road beside the lake for about 3 kilometres I found this little path. Steep! For almost 2 kms it averaged 15% – going through a couple of little tunnels and then up to another dam/lake. The view down to the bigger lake is pretty incredible. I decided to skip the hike to see the dinsosaur footprints (see below) and started heading back – which allowed me to climb the other side of Col de Montets while returning to Chamonix. 75 kms and about 2200 metres of ascent. Fun. There is a hike above the little lake to see dinosaur tracks. 250 million years old. 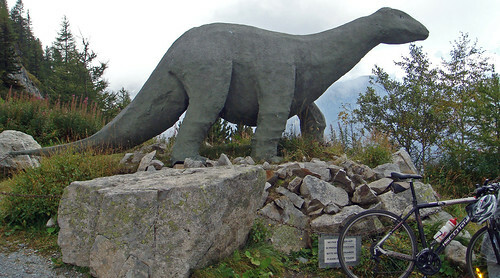 And I actually bumped into a dinosaur – above Col de la Gueulaz. Ouahh ! Great photos et beautiful landscape ! History… engineering… paleontology… and of course cycling. What a day Will! AND… to rub it in our faces even more an absolutely beautiful day. PLEASE… PLEASE… keep these posts coming. One day when I grow up… I want to live in Europe for part of the year. Nice pictures, where did you find this nice weather?. It is gray and raining everyday here in Zurich. I guess it is nicer to the West. I did the ride from Martigny to Emosson today. The weather was amazing with temperatures in the mid 20s. Despite such warm weather, at the top of Emosson there was still plenty of snow around. The lake itself is practically empty (because it does not start filling up until the glaciers start melting) and frozen over! It’s an amazing sight, a complete contrast to your photo above Will. The views of Mont Blanc and the various glaciers are to die for. 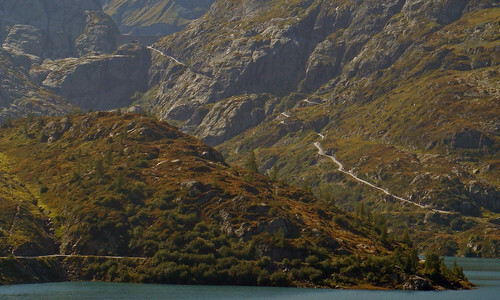 The road up to Emosson from Finhaut is still closed to cars but you can go by bike, no problem. Thoroughly recommended, it’s my favourite ride in the region. In total it is around 70km there and back with 2’400m ascent. The climb from Martigny Croix up the Col de la Forclaz is exactly +1’000m ascent, so if you have a computer you can be very sure of how far you have to go! I’ll be staying in Martigny for a week next July. Lac d’Emosson is definitely on the list of ‘must do’ climbs while I’m there – are the final couple of km up to Vieux Emosson doable on a road bike?, I’ve also pencilled in La Grande Dixence, Lac de Sanetsch, Lac du Mauvoisin, Lac de Moiry (& Zinal) & possibly Lac du Champex (& Grand St Bernard). 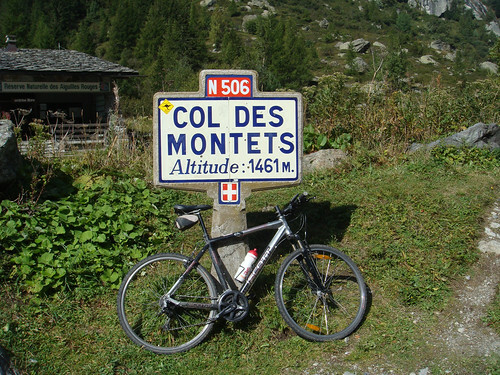 Also considering doing either Verbier (& Croix de Coeur) or Ovronnaz & Crand Montana. Is there anywhere you would recommend above these rides? Sanetsch is the absolute best. Prioritise it. I have never done this: but it is possible to make a giant loop, by descending the back side on a tiny cable car and looping back via Col du Pillon and Col de la Croix. Huge ride. If interested I have friends that have done it and could find you a strava map. Other good road bike rides nearby: search my site for Morcles. 29 signed, steep hairpins a little north of Martigny. Top half is unpaved but the 29 hairpins fully paved. Again further north, from Aigle, the climbs to Col de la Croix, and to Lac d’Hongrin are superb. 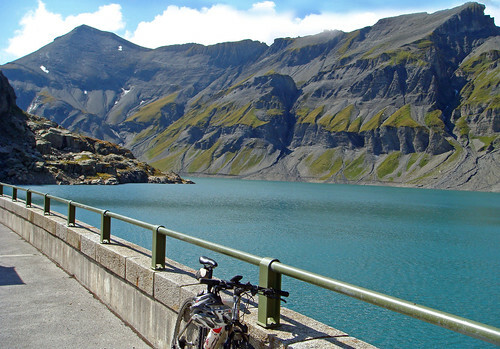 Further into Valais, the Mattmarksee is another great dam ride. Personally I am not convinced the Swiss side of Grand St Bernard is great as there is a fair bit of fast traffic including lots of traffic, although the last § kms on the old road, above the car-only tunnel is fantastic, as is the Italian side. When I rode Champex, I also visited Val Ferret. If you do Champex, I think my route on this site was the more fun side up. Lots of hairpins. From Martigny is also a way up to Col des Planches that I believe is good, but I’ve never ridden that side, but you could return from the valley zith Verbier, Mauvoisin, etc to Martigny via Col du Lein. thanks so much for your reply – there is definitely some food for thought there! A couple of people have said that Grand St Bernard from Martigny isn’t that special, so will probably give that a miss (or just do the bit after the tunnel). The big loop of the Sanetsch via Col du Pillon & Col de la Croix sounds amazing – I’ve managed to find a 75 mile loop on Strava which looks like it includes the cable car to Gsteig, so will be adding this to next year’s itinerary!! I was in Aosta back in June & we did a few drive-away days too, so we could take in the Nivolet (possibly my best day ever on a bike) & a separate trip to do both sides of Mont Cenis & a side trip to Petit Mont Cenis too – thanks so much for sharing your rides! thanks so much for you advice & suggestions for rides around Martigny. Martigny to Verbier & back. Sanetsch Loop via Pillon & Croix. Mauvoisin, back way up to Verbier & Planches. Forclaz & Emosson (final 2 climbs of stage 17 of TdF). Champex Lac & Val Ferret.